Decapitating a Tree at OSH. Topping a Tree in the OSH parking lot. 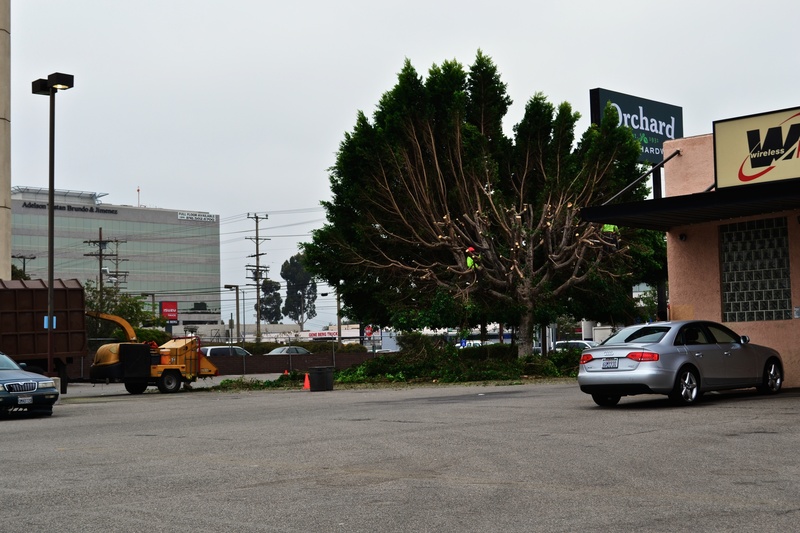 Tree “topping” or the indiscriminate cutting of tree limbs and branches, decapitating the living organism, is an ugly, harmful and wasteful practice that seems to be practiced all over the San Fernando Valley. When trees are cut down like this, what remains is an injured and destroyed plant that provides no shade, and is destined to die. One might hope that OSH (Orchard Supply Hardware), a home/hardware store that sells plants and fertilizers and advises the public on gardening, might have more sense or sensibility. But there they were today, hacking and chopping and murdering a large shade tree in the middle of an asphalt parking lot, a tree that provides shade and protection. No doubt they took the lowest tree cutter bid and here is the result. If you notice the growth of current elongated branches being chopped off, this tree has had the same topping treatment a few years ago. This is a repeat treatment. But I think trees are tougher than we think and it’s unfair to blame the workers. We don’t know who started these tree circumcisions but it may not be any one nationality. The SF Valley has more tree canopy than the rest of LA, go aerial view on google earth. I went back to the OSH parking lot yesterday, and the entire tree has been removed. Only the stump remains. Oh thats a shame but its ok as long as they are replacing. Andy you should survey the recently denuded space shuttle street route. That’s a shame but I’m glad you’re on it. People actually do this, and its not uncommon??? I don’t understand what the hell is wrong with the ‘vandals’ that did this, just in general, what the heck is wrong with some people and what joy do you get out of doing it to a tree? wait a few years and it will be. I was just talking about this horrible devestating trend in van nuys. I go out of my way to shop at osh. And there are few enough trees in the San Fernando as it is. Has anyone spoken to the manager as to why? I plan too. I’m hoping that by posting this photo the stupid management of that store will take notice, and others who hack trees will think twice of the result. ← Preserving the Century Plaza Hotel in Century City.